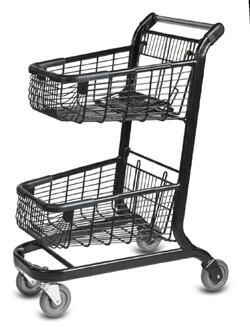 This double basket shopping cart comes with a rounded chassis and basket to provide a stylish addition to your store. Two baskets and a small base affords customers the ability to seperate purchases while taking up limited space in the store. Double basket designs give stores the ability to store more carts while providing more shopping options for their customers. Weight of cart: 45 lbs.